AMAZ Jennifer Hanks is the author of The Dimarco Series as well as The Elite Securities Series. Her stories are contemporary romance and romantic suspense, all with the underlying message of the power and strength in love. She’s also a sucker for a Happily-Ever-After. Her love of reading and books in general started at a very young age and has steadily grown into a love of writing as well. She admits to being addicted to all things romance and has no plans of quitting her habit. Jennifer lives in Pennsylvania with her two children. When she’s not reading or writing, she can be found with her kids at their various activities. Her house is frequently filled with any combination of her children’s friends, nieces, nephews and a variety of pets. To ask Jennifer Hanks questions, please sign up. Thank you so much for letting me know the buy button isn't working, I had no idea. It looks like I have to email goodreads to fix and will check the other books as well-hopefully they're fine. It's ridiculously frustrating to have to go through all the books on Amazon with search results for Lucy, I completely agree. I'll leave the direct link to amazon here, hopefully that works (LOL) and in the meantime, I'll have goodreads fix the problem. Again, thank you so much for letting me know!! Jennifer Hanks Writer's block is the worst! I usually just take a break from writing for a day or two and start again refreshed. 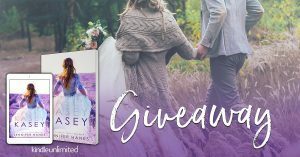 If you’d like a chance to win an ebook copy of my latest release, KASEY, then follow this link and hit submit! You’ll know right away if you’ve won and if not, check out KASEY anyway, which is only $0.99 and FREE in KU! "Elaina by Jennifer Hanks is book Four in The Dimarco Series. This is the story of Jake Dimarco and Elaina 'Laney' Jones. I have read the previous books, but feel you can make this a standalone book if you wish to do so. We’d love your help. Let us know what’s wrong with this preview of Elaina by Jennifer Hanks. Love 💘 all of these so far .I'm glad I found your series of books You keep me interest and I can't put it down Can't wait for luke and nicks story or the others too!!!"